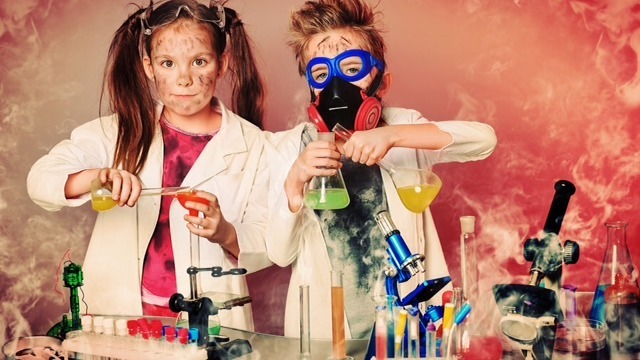 If you’re keen to get your kid interested in STEM, we’ve got 6 strategies to help you open their eyes to the wonders of science and technology! According to STEM education advocacy group Change the Equation, just 56 percent of high schools offer a computer science class of any sort. The situation with science isn’t much better. “Science class is not well connected to broader, relevant things in the workplace and to life after school,” agrees Claus Von Zastrow, director of research at Change the Equation. No wonder by the time they get to high school, only 37 percent of students tell pollsters they like science class. So what do you do if, as a parent, you’re convinced this just isn’t good enough? How can you nudge your own kids towards an interest in STEM? The good news is you have a lot to work with. First, kids are naturally curious about the world. The same poll that found a minority of kids like studying science in school, also found that 81 percent liked science itself. Second, there are a ton of resources at parents’ disposal to help you open your kids’ eyes to the wonders of STEM. 1. Explore the world together. In fact, the world itself can be seen as one huge laboratory for your kids to explore. Encourage them to ask questions and find their own answers. “Instead of answering questions such as, ‘Why do leaves change color in the fall? ; turn the question around and ask them what they think,” Stratton advises parents. Von Zastrow has an even more specific suggestion: Science Buddies, a website that offers thousands of ideas for at-home experiments. Or check out citizen science projects that allow young people to take part in actual, ongoing studies in which real-life researchers deputize the public to help sift through or provide data, from examining silt for micro-fossils to photographing lady bugs for entomologists. Scientific American has a list of ongoing projects. Online coding classes and programs are a good bet as well – you can check out this list of free websites that teach kids coding. 2. Introduce them to STEM professionals. This tip may be easier for parents who work in a STEM field themselves, but introducing your children to real-life scientists and technologists can go a long way to proving STEM leads to viable and fascinating career options. If that’s a stretch given your location or social circle, your local library may be your next best bet. “Many books now exist for primary students including non-fiction offerings such as Ada Byron Lovelace and the Thinking Machine by Laurie Wallmark and The Boy Who Harnessed the Wind: Creating Currents of Electricity and Hope by William Kamkwamba and Bryan Mealer; and fictional offerings such as Rosie Revere, Engineer by Andrea Beaty,” Stratton points out. 3. Provide the right kind of toys. Children’s books and web resources can help parents spark a love of science, but so can the right kind of toys. And today, thankfully, there are more great options than ever before. Focus on multi-functional toys that allow for open-ended play, suggests Stratton. “Some of my sons’ favorite activities over the years have included Magna-Tiles, GoldieBlox building sets, and Minecraft,” she says. Or just stick with old standbys from a time when childhood was less structured and more imaginative. “I would also encourage parents to supply their children with basic supplies and unstructured time to allow them opportunities to explore the outdoors, observe insects and wildlife, and build structures with cardboard, sticks, and other recycled items,” Stratton adds. 4. Explain that STEM is for everyone. While there are excellent toys out there for budding scientists, there are also some offerings at your local toy store that send exactly the wrong message, especially for girls. Von Zastrow suggests that while books or toys that portray space exploration or dinosaurs as “for boys” and ironing and fashion as “for girls” are highly annoying (and still all too common), they also offer parents a perfect teaching moment. For more resources to encourage your little girl to get excited about STEM, check out GoldieBlox, Black Girls Code, EngineerGirl, Girls Who Code, Yellow Scope, RoboGabby and A Mighty Girl for games, books, tutorials, events and more! 5. Find the science in your kid’s hobby. Another approach to encourage a love of science and tech is to enter through the back door. Rather than pushing STEM directly, figure out what your kids are already passionate about already and highlight how that connects to technology and science. There’s a link for almost any interest you can imagine. “I’ve learned it takes an army to keep people moving forward, especially women in engineering. They need encouragement and nudges in the right direction all along the way,” agrees aerospace engineer Jamie Krakover. “The most important thing a parent can do to encourage a love of science in their child is to provide support and encouragement,” concludes Stratton, who points to research showing that encouragement from family and peers is the key to getting kids interested in STEM and keeping them hooked. In other words, you really do have the power to shape your kids’ feelings about science and technology. Now go exercise it wisely. Hackbright Academy is the leading engineering school for women. Learn more about the programs we offer here.